Review: A film set in the 1950’s. 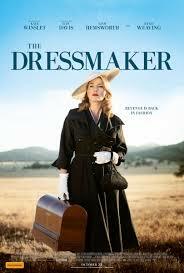 Tilly Dunnage returns to her small town in rural Australia. She arrives with her sewing machine and couture style. While she is back she attempts to uncover the truth about a death that occurred many years before. This is based on a best-selling novel by Rosalie Ham. All the performances were brilliant. How Kate Winslet kept a straight face when Liam Hemsworth took his shirt off I really don’t know. I do know that film critics have rubbished this film but I enjoyed it a lot more than I thought I would. For Kate Winslet to do her part for the film she learnt to sew. This film spent 13 years in development before filming began. The themes that are in this are tragedy, love, revenge and also hate is present in abundance. This has got very much of a Shakespearean atmosphere to it, especially the play Macbeth. At the end it did bring quite a few memories back as I have been to Melbourne and therefore can relate to the film more.